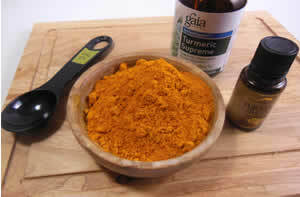 For beautiful skin take a turmeric capsule daily. In the Ayurvedic tradition it is said that if a pregnant woman takes turmeric regularly, her child will have gorgeous skin. To help stabilize blood sugar in diabetes, take 2 "00" size capsules of turmeric powder, 3 times a day, 5 minutes before meals For problem skin and fungus infections a direct application of turmeric resin oil of turmeric can inhibit many common problem fungi. Dilute the resin with water (one part oil to two parts water) and apply it directly to the affected area. Cautions: Turmeric oil can cause some temporary staining of skin and clothes.